BANFF, ALBERTA, Canada – Banff National Park and the surrounding countryside offers some of the most exhilarating natural scenery in North America. Our exciting ATV tours will show you the Canadian Rockies like you’ve never seen them before and are likely to be the highlight of your Banff, Albert vacation. Our professional guides take you on a whirlwind tour of the best Banff ATV mountain trails, providing you with breathtaking views of Canada’s most awe-inspiring national park.Reserve a spot on one of our many guided Banff and Lake Louise ATV tours. We offer a wide range of trail options suited to beginners as well as experts riders. Our ATV tours will take you to some of the most spectacular wildlife viewing areas in Banff, Alberta. On our journey we’ll traverse colorful valleys, mighty forests and majestic mountainsides up to 8,000 feet above sea level where you’ll observe elk, mountain goats and lots of other Canadian Rockies wildlife. Be sure to bring your camera: in addition to animals you’ll witness some of the most impressive landscapes on earth! Looking for additional thills and excitement? Combine your Banff National Park ATV tour with an unforgettable white water rafting tour that’ll provide with the adrenaline rush of a lifetime. We also offer sensational zipline adventures in the Canadian Rockies that give you a bird’s-eye view of Banff National Forest. Book now through Banff ATV Tours and experience the sublime beauty of the Canadian Rockies. Avoid agency surcharges by booking your tour directly with us. Check out our package tours designed to give you the greatest flexibility possible on your Banff, Alberta family vacation. Our Banff ATV Tours offer the adventure of a lifetime. You’ll leave with tons of great memories and photos you thought you could only dream of. With so many amazing options and spectacular landscapes, the biggest challenge is deciding what to leave out. We’ll help you make the best decisions to ensure a great Canadian Rockies vacation. 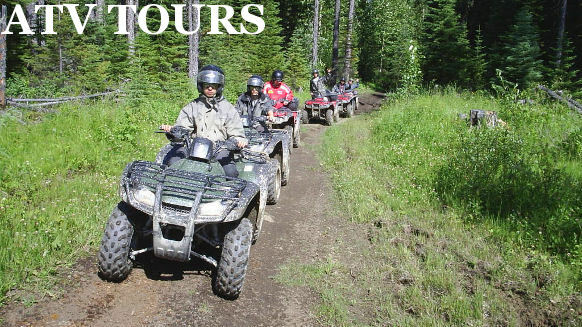 Banff ATV Tours offers all season adventures throughout the year. We guarantee a unique Banff National Park and Canadian Rockies experience any time of the year. Your Canadian Rockies vacation begins today. Just fill out the contact form and ask for more information about our guided Banff ATV Tours. Don’t miss this incredible opportunity to enjoy an action-packed, exhilarating outdoor adventure in one of Canada’s premier vacation destinations with Banff ATV Tours! Watch this cool All Season Adventures video! Our number one concern at Banff ATV Tours is your safety. An ATV is a powerful machine that requires proper training and safety precautions. We’ll teach you the fundamentals of safety and provide you with excellent equipment to ensure a safe ride. Many of our riders go on to become ATV enthusiasts who travel to the some of the world’s most remote hunting and fishing destinations. Your life-long adventure starts here!